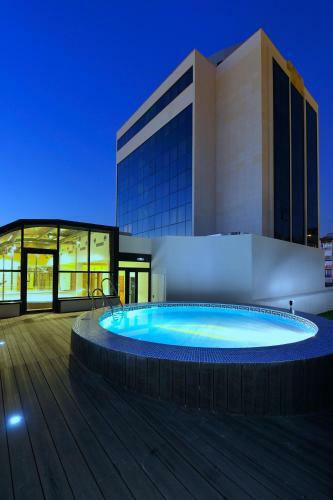 The Abba Hotel Granada offers an outdoor pool, a gym and a spa with Turkish bath, hot tub and saunas. Rooms include LCD satellite TV. Granada Train Station is 300 metres away. Abba Granada is located next to Fuente Nueva Park and the University of Granada. The historic Albaicin district and Granada Cathedral are around 1 km away. Each air-conditioned room has modern decor and elegant dark wood furniture. Bathrooms come with toiletries and a hairdryer. Free Wi-Fi is available throughout the hotel. Staff at the hotel's 24-hour front desk are happy to provide information about the city. The hotel's Abba Mia restaurant serves Italian and international food. You can try typical tapas in the lively Elvira Street, a 10-minute walk away. This hotel is 2314 metres from the Alhambra entrance, 1287 metres from Plaza Nueva (the absolute centre of Granada), 385 metres from the train station and 1757 metres from the bus station.